This feature on canola farming in Kenya was first published in the Business Daily by Gitonga Marete. At the beginning of this farming season, Japhet Mwongera, a small scale farmer in Buuri sub-county, Meru County intended to leave his farm fallow for a year. But John Mwiti, an extension officer from Agventure Limited told him about the benefits of canola farming in Kenya. 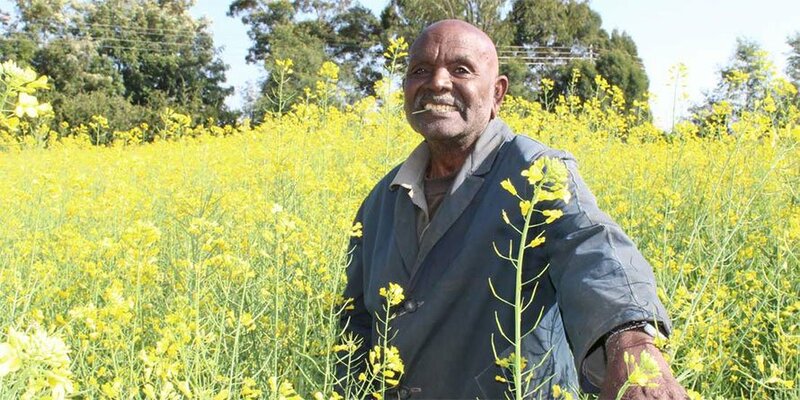 He decided to plant the crop and thus became a pioneer canola farmer in Meru County. And Mr Mwongera is now making handsome returns from the new crop. His crop is the subject of admiration by other farmers — he projects to harvest 15 bags each weighing 100 kilos from the one acre, earning at least Sh60,000. Having spent Sh20,000 for input, this will mean he will earn a profit of Sh40,000 in four months. “It is not little money given that when I was approached to plant the crop, my intention was to leave it fallow for at least one year after harvests declined to almost zero. In the last season, the potatoes I had planted here did not do well,” he said. Mr Mwongera is one of the small scale farmers in Meru, Nakuru and Narok counties who have embraced canola farming which has been the preserve of largescale farmers, as a way of improving yields, controlling weeds and reducing the effects of climate change. “Over the years, the farmers have cultivated crops such as wheat, barley, maize, carrots and cabbages with few alternatives for rotation, forcing them to use too much fertiliser resulting to depleted soil fertility,” said Giles Littlewood, Agventure operations manager in Nakuru. “Canola is used in conservation farming and it reduces erosion, improves soil water retention and leads to fewer weeds, pests and diseases with increased yields of more than 20 per cent for other crops,” he said, adding that the main objective was to teach farmers on how to grow the crop for rotational purposes. Agventure which buys canola seeds from farmers at Sh40 a kilo, is also training them on better agricultural practices with a view to alleviating effects of climate change, in partnership with SNV Netherlands and Unilever East Africa. While SNV is providing funds for the project, Unilever buys canola oil processed by Agventure, which is also an international seed company. Eric Kimisoi, a farmer in Nakuru, said after several years cultivating wheat, maize and barley, his farm was so depleted that he planned to leave it fallow for a year. Last season, the 86-year old farmer had planted wheat in two and half acres but did not harvest anything, leading to a loss of more than Sh30,000. “When I was told that there is a crop that can improve my soil, I agreed to experiment,” he said, adding that he expected to harvest at least 20 bags of canola each weighing 100 kilos, which would earn him Sh80,000. Mr Kimisoi said one of the challenges he faces is that when there are weeds after the crop has grown, it is not easy to plough and the weeds must be uprooted manually. However, this arises if the farm is not prepared well before planting as it happened to him. According to Jason Kamunya, the project manager, farmers in the country face the problem of mono-cropping that has led to build-up of diseases and pests, resulting to declining productivity and profitability of farms. “As a strategy we have adopted conservation agriculture and helping farmers understand the three key principals: minimum disturbance of the soil so as to conserve as much moisture as possible; soil cover helping to conserve moisture and building organic material and crop rotation. “We are emphasising on conservation agriculture reaching out to farmers and helping them understand its principals which will contribute to high yields and improve food security,” he said. The officer said some crops are shallow rooted, especially the cereals. Canola, with its deep roots that go up to two feet into the ground, help in pumping nutrients to the top soil so that other crops use it. “It is not only growing the crop but helping farmers to conserve the soil. We also do soil testing so that we are able to decide the amount of fertiliser that is going to be used on the farm. One of the serious blunders of our farmers is that they don’t carry out tests on soil,” Mr Kamunya said.